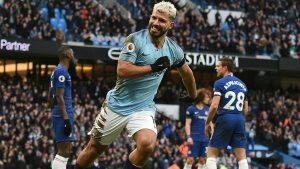 Argentine forward, Sergio Aguero grabbed a hat-trick as Manchester City scored four times inside 25 minutes to humiliate Chelsea 6-0 to move to the top spot in the Premier League ahead of Liverpool again on goal difference on Sunday. Star player of the evening, Aguero should have gotten more than three as the Argentine missed a glorious early chance and hit the bar in the second-half in a humiliating afternoon for the former champions. 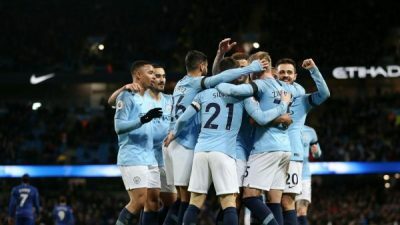 Raheem Sterling also started and ended the scoring and Ilkay Gundogan also netted in the first quarter of the game as City ended what could have been a testing week with a trip to Everton in between the visits of Arsenal and Chelsea with maximum points.